2x32x1RU 32MV1/MVJ-3T, Mid-size Video. Most common. The highest density video panel currently available, these Mid-size Video patchbays are typically supplied with your choice of ADC, Kings or Trompeter dual self-normalling, 75 ohm terminated, digital-ready jacks (self-normalling unterminated mid-size jacks also available). Consult factory. Configuration Order No. Order No. Order No. Order No. ADC jacks are rated up to 3GHz and 20,000 mating cycles. 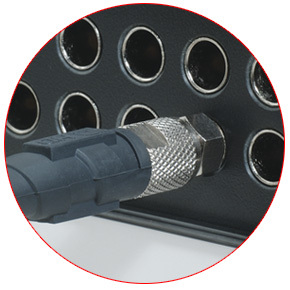 Rear view of mid-size video patchbay showing staggered BNC termination. Kings jacks will operate to 3.5GHz and 30,000 mating cycles. 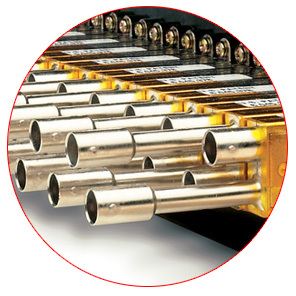 Trompeter jacks are rated to exceed SMPTE 292M specifications and 30,000 mating cycles.